In this banh mi recipe, I stuff fresh baguette with pickled veggies, cilantro & marinated tofu. Try it to see why this sandwich is a fan favorite! When I lived in Austin, I never had a reason to make a banh mi sandwich at home because some of my favorite banh mi places (Lulu B’s and Elizabeth Street) were right down the street. 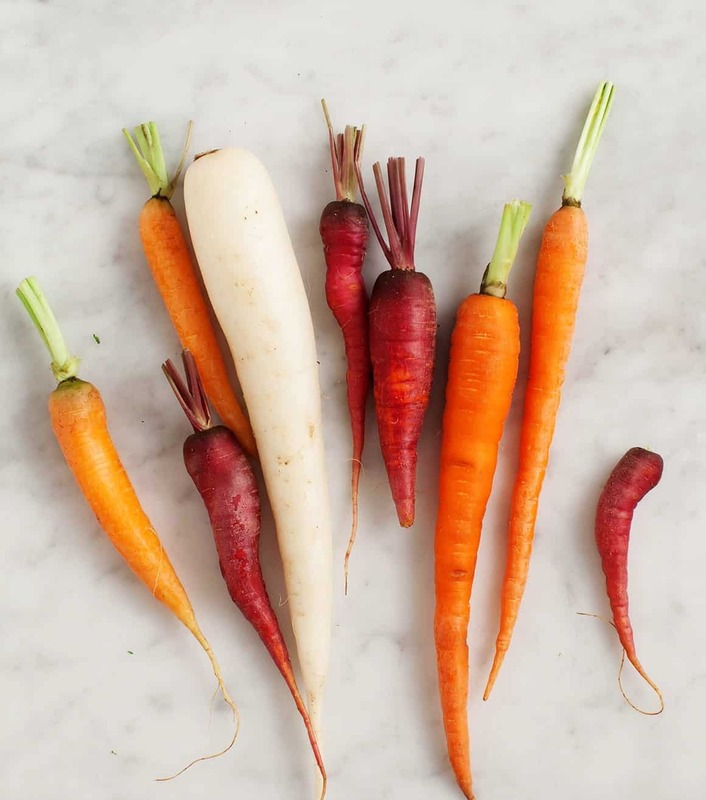 But suddenly daikon radish started showing up right next to my favorite colorful carrots at the farmers market, and I knew some homemade sandwich-making was in order – the carrot and daikon were perfect for making the pickled vegetables that a good banh mi recipe requires. Since we’ve moved, I’m still searching for the best banh mi in Chicago (let me know if any of you have suggestions!). Until then, I’ll continue making this yummy recipe to curb my banh mi cravings at home. Hold on, what is a banh mi, anyway? If you’re asking that question, you’re in for a treat! A banh mi sandwich is a spicy, sweet, tangy, and totally crave-able Vietnamese street food. Typically, it consists of a fresh baguette filled with pickled carrots, daikon, cucumber slices, cilantro, chilis, mayo, and a protein. Traditional banh mi can be made with pork, chicken, or egg (among other protein fillings), but I use tofu in this recipe to make mine vegetarian. And, P.S. this recipe can be made vegan if you just use vegan mayo on your sandwich. What’s special about this banh mi recipe? The night before I’m planning to make my banh mi, I prep my pickles. First, I thinly slice daikon, carrots, cucumber, and jalapeños and stuff them into a jar filled with a salty/sweet brine of white wine vinegar, rice vinegar, sugar, and salt. The next day – when I’m ready to eat (!) – I make a quick tamari-ginger-lime marinade for the tofu and sear it on each side until golden brown. Then, I stuff it into toasted baguette with mayo (you could use vegan mayo), the pickled veggies, cilantro, and a good squeeze of sriracha. Finally, I dig in to this hearty, satisfying sandwich! This recipe looks a little long, but if you make your pickled veggies a day ahead of time, you’re halfway there. And heads up, you will have extra pickles which means that you can have another banh mi later in the week. 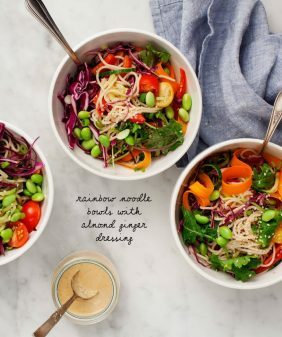 Alternatively, store them in your fridge to make salads or these spring rolls. Make ahead: Place the daikon, carrots, cucumbers, and jalapeños in a medium jar with the white wine vinegar, rice vinegar, sugar, and salt. If the liquids don’t cover the veggies, add about 2 tablespoons water and more vinegar if necessary. Let chill for at least an hour, or store in the fridge for up to a week. When your pickles are ready, drain the tofu and slice it into ½-inch slices. Place it on a towel and gently pat dry to remove excess water. In a small bowl, whisk together the olive oil, tamari, lime juice and zest, garlic, ginger, and pepper. Place the tofu in a shallow pan and pour the marinade on top. Flip the tofu to fully coat it, adding more tamari if necessary. Let the tofu marinate for at least 15 minutes. Heat a nonstick skillet to medium-high heat. Add a little oil to the pan and place the tofu pieces with enough space between each so that they’re not too crowded, working in batches if necessary. Without moving the tofu slices around too much, let them cook for a few minutes per side until they’re deeply golden brown and caramelized around the edges. Remove from heat and season to taste. 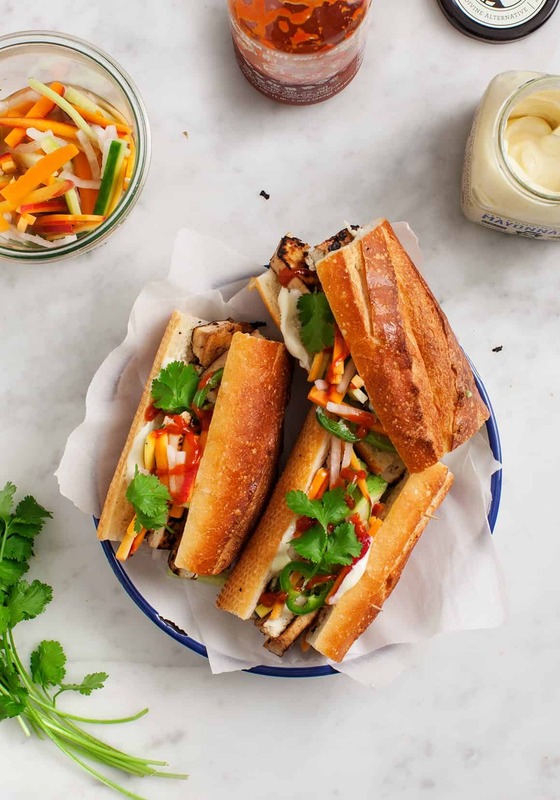 Assemble sandwiches with the baguette, mayo, tofu slices, pickled veggies, and cilantro, and serve with sriracha. For seared tofu, I like to use West Soy Extra Firm Tofu. I find it to be a bit less watery (and easier to work with) than other brands of firm tofu. For the pickled veggies: if you can't find daikon, just skip it. And if you're sensitive to spice, go light on the jalapeños. Other ideas: add sautéed shiitake mushrooms or slices of avocado. I don’t eat tofu often, but this looks so yummy I might have to try! The colorful veggies are so enticing! Pinned! I don’t either. I wonder if it would be just as good to replace the tofu with sautéed mushrooms? I’m not big on tofu either, but this was really really good. We used the extra tofu in some fried rice later. You might want to give it a try. This looks delightful! I’m so going to add this to my menu plan for the week ahead. I made veggie “meatball” subs this past week with peppers and my husband loved it. I can’t normally get him to eat cucumber (I still have no idea why not) so I’ll see if I can sneak it in this way. Breakfast bahn mi! I love that idea. Beautiful pics as always. Such a gorgeous and healthy sandwich! Love, love, love! I am vietnamese and also an Austinite! If you want to try a delicious and authentic banh mi I recommend you go a little north to Hong Kong market at 183 and Ohlen — a cute little couple make banh mi at a counter at the back of the store and it is delicious! 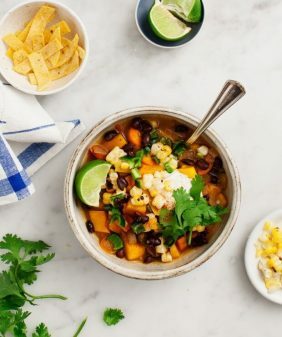 This homemade version looks so delicious (as does all your food)! I am totally going to try that tofu marinade. I LOVE LOVE LOVE your blog! So happy to have found it! Hi Christine – thanks! We’ll go check it out this weekend! These look amazing! I have always wanted to make my own after having them so many times at restaurants. I will definitely be trying out this recipe. Thanks for sharing! 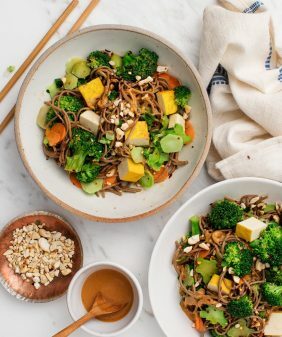 I think this recipe will be the one to convert me to eating tofu, never been a fan but this looks amazing. This looks and sounds amazing! 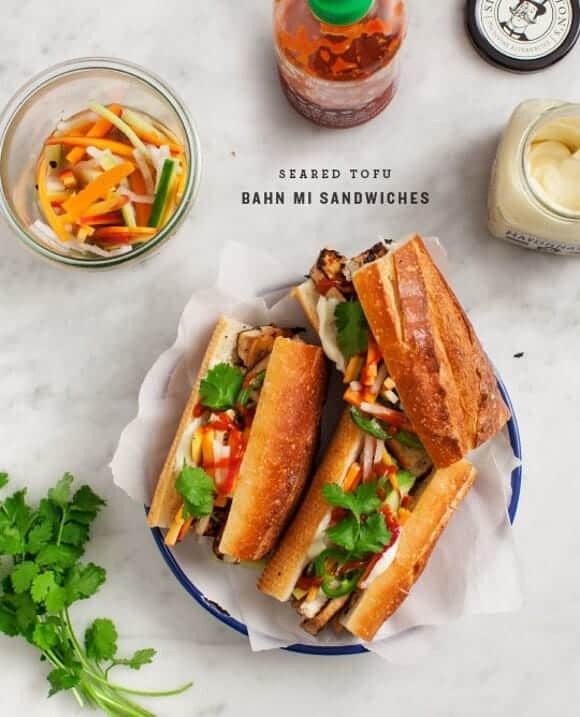 I’ve never had bahn mi before, but am tempted to make this at home now for my first try. Especially love those pickled veggies. Amazing looking sandwich. I just pinned it to make soon! This looks amazing, I will have to give it ago asap, I’m also loving your pics! Looks delicious! Be sure to check out my blog as well, I love cooking and eating healthy along with food photography. I also have an obsession for lemons :D! 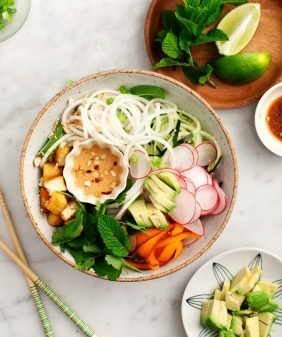 Love Bahn Mi and this recipe looks delish! I have been doing tons of pickling lately and just picked up some daikon (cashier had no idea what it was). I was planning on pickling it with carrots but I love how you included jalapeño and cucumber. Hmmm. . .perhaps a quick jaunt to the grocery store is in order. I love this – Bahn Mis are my favorite!! Ever since moving away from SF, I’ve been craving one! Thank you! Living in sunny Portugal brings lots of joy but it doesn´t come in the way of Vietnamese food, especially street food. So I am looking for recipes to share this cuisine with my readers.Will definitely try this one. Ha, maybe one day I’ll do a guide to tofu, if you think that would be helpful :). There are many types and different ways to cook it (the kind cubed in miso soup is on the plain side). I think tofu gets a bad reputation when people want it to taste just like meat (because even the meatiest version still won’t taste like meat to a true carnivore). You have to kind of like it for being it’s own thing… maybe it’s an acquired taste, I’m not sure because I’ve liked it for so long! I have yet to eat one of these sandwiches. l live in a small town. BUT now we do have a place. So I am going to try ‘the place down the street’, because your post looks delicious and I was reminded. What a lovely thing to have on my ‘to do ‘ list. Even though I’m sick right now this looks like heaven on a bun! I absolutely LOVE Tofu Banh Mi and have been craving one ever since coming back from New York. I always thought to make it at home but never got around to it. Now I have no excuse. This looks incredible and the fact that you pickled your own veggies is a huge plus. Love quick pickling! Also, how in the world did you find a small daikon? The ones I find look like they’re on steroids! Ha, let me know if you give it a try :). The ones at my farmers market (like the one pictured) was on the small side. But I’ve definitely seen ones in Japan that are the size of a small arm! You can adjust the vinegar amounts and pickle as much as you like… it’ll last in the fridge for awhile. Ahh! I LOVE banh mi, and used to get the tofu and mock duck curry band mi from a local place. The fillings are ‘incidentally’ vegan, so I didn’t think anything of it. Then, a friend learned that the bread has egg in it! 🙁 It was really sad news, and I’ve been missing my banh mi since then. Sandwiches are not usually on the top of my list to make, but this one would certainly cut in line. I think marinated and cooked tempeh would be a good sub for tofu as well. And these pickled vegetables, wow! So very excited about this recipe! Yum! This look so delicious Jeanine! I’m a massive tofu lover! Is it just me, or is it really hard to find hearty, filling vegan sandwich recipes? This looks amazing and I can’t wait to give it a try – thank you! Plus, anything with sriracha is a big win for me. This looks so good. Glad that you posted this recipe, maybe I can try it soon. More awesome Vegan options. thanks Jerrica – I’m so glad you liked it! This looks delicious and the tofu marinade sounds perfect, I love the combo of ginger and lime and I think tofu is best when it gets to carmelize. I might just try the tofu all on it’s own, it sounds that good to me. oh man. i lived in austin as well and just recently moved back to illinois so i’m missing lulu b’s and elizabeth st. HARD. i don’t think i’ve had a bahn mi since then. i can’t wait to try this recipe! you rule! Oh wow! This has me craving a banh mi now. Nom nom! Made these tonight. They were amazing. I’ve never had banh mi before. Thank you for the recipe. I will be making these on a regular rotation. What a lovely photograph! Sometimes vegetarian banh mi is all ya need right? I usually don’t pickle my cucumbers for this but that sounds good too, will try it out. made these sandwiches today for lunch! They were a hit! Thank you! I did put my own spin on it by making my own mayo. Mixed mayo with cilantro,lime juice,ginger and small amount of soy sauce! In addition to that took a bit of hoisin sauce mixed that with Sriracha to drizzle on the sandwiches as well. Debating on added a fried egg like they do at the Vietnamese sandwich shop that I go to! Thanks again for this recipe! Hi Teri – so glad you liked them! Hum, your mayo sounds super delicious! This looks really amazing and I’m planning on pickling vegetables today. One question, though: the recipe says let sit for at least an hour or at least one week. Could you clarify that? Thanks!! Hi Amy, I meant to say that they’ll last in the fridge for up to a week after you make them. Hope you like! 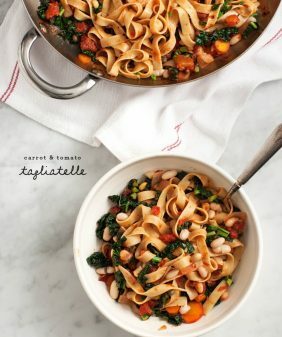 This looks delish, hoping to make it tonight. I’ve made refrigerator pickles in the past and was told to simmer the wet ingredients before adding to veg. Is this not necessary? Hi Breana, it’s not necessary if you’re putting them in the fridge (it is necessary if you’re canning). Sometime I heat my brine, most of the time I don’t. If you’re adding spices to your brine, simmering it will help infuse the flavors. In this particular recipe, I haven’t found it to make a big difference either way. Thank you for good recipe. I introduce your recipe on my blog in Japan. Liked your recipe a lot. Looking forward for some more mouth watering recipes. Keep up the good work. If I can’t find daikon, is there anything you recommend as a substitute? not a big fan of toffu but this looks amaizing!! how long does the pickle last in the fridge? Thank you for posting this recipe! I substituted sugar syrup for the oil in the marinade since I am on an oil free diet. I also skipped the mayo on mine but put it on my husband’s. It was delicious even with those substitutions. My iPad won’t let me give it stars, but it deserves 5! Hi Debra – so great to hear – glad you and your husband loved them! Tried these sandwiches and loved them. I skipped the mayo and added hoisin sauce instead. Thank you for posting it. 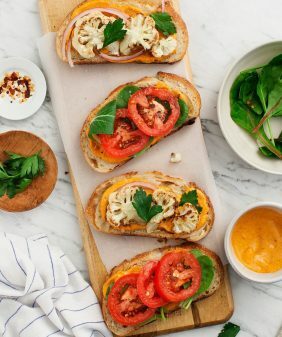 My mostly Vegan family loved these sandwiches! We ate these 10 years back in Sydney, Australia. Amazing, another lunch sandwich for my picky 11 year old. Hi, I’m just wondering if the tofu marinade could be made ahead of time/how long it will keep in the fridge? Thanks! how long does it trake for prep and make time? Making this tonight, chicken for the family and tofu for me. I’ve been making Bahn Mi for years and my recipe is a bit different, but I came across this and knew it would be a perfect meal. LOVED the pickled veggies! Used a shredder instead of chopping into matchsticks and it was so easy I quickly went overboard and ended up with nearly 4 cups of veggies. Hanging onto the extra to make the banh mi spring rolls this week! Instead of mayo, try a more vegan variation, soft tofu whipped with crunchy peanut butter, sesame oil, lime juice and sriracha. Yum. Hi Amanda, I’m so glad you enjoyed these as spring rolls! Wonderful recipe. Have you tried flavoured tofu? Have you any alternative suggestions to frying tofu? I try avoid using oil. Perhaps baking? I like to drizzle tofu pieces with tamari (and a little olive oil) and bake for about 20 minutes until the tofu has firmed up around the edges. Toss with a little sriracha as it comes out of the oven. I also really like baked tofu that you can get ready-made (the Wildwood brand is really tasty and easy to find). Any of the above would work well on these sandwiches! Thank you very much for your suggestion. The description alone is mouth watering. I’m not sure where in Chicago you live, but I love the lemongrass tofu bahn mi from Bon Bon in Bucktown! Angelic Organics is a great CSA too if you’re looking for one! 🙂 That’s how I discovered daikon! I will have to try that, thank you!! I’ve heard of Angelic Organics – thanks for the recommendation! Funny, I’m not a vegetarian, but this banh mi is the first one that has gotten me excited about that sandwich. Thank you! Hi Susan, I hope you love it! Love tofu and use it often and living in Australia banh mi is oft made, and, yes, for breakfast too! But have never made it vegetarian or put the two together: methinks a treat in store 🙂 ! Hi Eha, I hope you enjoy the sandwiches! Thanks Michele, I”m going to check it out!! Literally salivating. I need these in my life STAT. Doubled this to make for a group of friends tonight. Got a lot of compliments! The tofu marinade is amazing and the tofu turned out really flavorful. The pickled veggies are also superb. Hi Anna, I’m so happy to hear that everyone loved these! This recipe is delicious! I didn’t think I would like tofu (I’ve only had mock duck bahn mi in the past) but the texture and flavor worked very well. My grocery store didn’t have daikon so I used red radishes and julienned them into teeny tiny pieces. It was a pain, but the flavor was good. My two sons begged me to make these again. And my husband who’s not a vegetarian went in for seconds. Thanks for the recipe! This will definitely be added to our regular meal rotation. Ooh, I’m so happy you all loved the sandwiches! Thank you for sharing!